Here are a couple of #summer fruits and a vegetable for you to enjoy. Why: They’re crisp, delicious, low in calories, go with almost any food, and add great color on the plate. In addition, red bell peppers have three to four times more vitamin C than citrus fruits, and green, yellow, and orange bell peppers are also higher in vitamin C than citrus. Red bell peppers are fully ripened green bell peppers. Green bell peppers are unripe and immature. Orange, yellow, and purple peppers are different varieties of the bell pepper and reach their appropriate color upon ripeness. All peppers become sweeter as they ripen. Also, as an interesting side note, bell peppers contain a recessive gene that inhibits the concentration of capsaicin, which is what makes chili peppers hot and spicy. Health Perks: Red bell peppers are one of the best sources of beta carotene, the form of vitamin A found in plants. And red bell peppers also contain approximately 11 times the beta carotene of green bell peppers. In addition, they are an excellent source of the phytochemicals lutein and zeaxanthin, which are known to protect against macular degeneration. Bell peppers of all colors are also good sources of vitamin B6, fiber, folate, potassium, and many other vitamins and minerals. And they contain the phytochemical lycopene, which has been shown to reduce the risk for certain cancers. A 2007 study published in the Journal of Food Science compared the antioxidant activity in all four colors and found that the quantity of antioxidant phenolic compounds was greatest in red bell peppers, followed by orange, yellow, and green. Purchase Tips: Research indicates that bell peppers of all colors are among the top 10 #vegetables for containing pesticide residue when grown conventionally. Therefore, it is recommended that you look for organically grown varieties. Why: Have you eaten a sweet-tasting raspberry? It rivals any candy you can think of — and it’s only 1 calorie per raspberry. 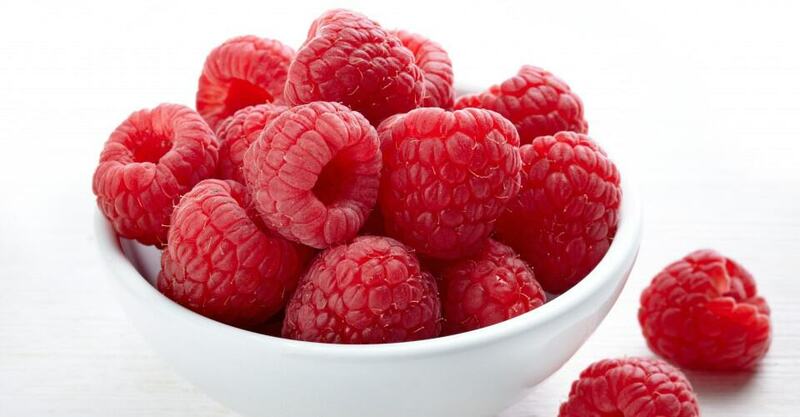 Raspberries are much lower in calories than you would think — only 64 calories for 1 cup. And just 1 cup provides 32.2 mg, or 54 percent of the recommended daily value, of vitamin C; 32 percent of your day’s supply of fiber; and 41 percent of the daily recommended value for manganese, which is a trace mineral that helps to catalyze enzymes required for various body functions. Nutritional Information (1 cup): 64 calories; 14.7 g carbs; 8 g fiber; 0.8 g fat; 1.5 g protein. Health Perks: According to a study conducted by researchers A. Venketeshwer Rao and Dawn M. Snyder from the Department of Nutritional Sciences at the University of Toronto, Canada, and reported in the Journal of Agricultural and Food Chemistry, red raspberries contain “a wide range of polyphenolic phytochemicals (flavonoids, phenolic acids, lignans, and tannins), “some of which may function as anti-inflammatory and anti-atherosclerotic and protect against LDL oxidation, thus reducing cardiovascular diseases. Anthocyanins and ellagitannins are the major antioxidant phytochemicals present in raspberries. Ellagitannins are tannins, not commonly found in foods, which react with water to become ellagic acid, and may slow the growth of some cancer cells. Recent research has shown that the ellagic acid in raspberries is highly bio-available. Anthocyanin, the pigment responsible for the red color in raspberries, helps reduce the risk of blood coagulation, preventing the development of blood clots involved in stroke, pulmonary embolism, and heart attack. Other research reported in the journal BioFactors found that raspberries have more antioxidants than strawberries, kiwi, broccoli, leeks, apples, and tomatoes. Additionally, the fructose combined with their high dietary fiber content, helps to regulate blood sugar by slowing digestion so that you don’t get those awful sugar spikes and subsequent letdowns. And even the little fat that raspberries do contain is almost entirely unsaturated fat. Purchase Tips: Raspberries are highly perishable. Look for plump, even colored, bright berries that are not bruised. Oh, and those hairs on the raspberries — called “styles” — are normal and part of the #fruit‘s defense mechanism. A little sweet, a little sour, a little spicy, and a little crunchy — this salsa is a perfect accompaniment to pork, chicken, fish, or beef. It’s also great over sliced fresh fruit or as an accompaniment to a cheese tray. If you prepare and refrigerate the salsa in advance, the jicama and apple will turn a pretty pink from the raspberries. In large bowl toss jicama and apple with vinegar. Add all remaining ingredients and toss to blend. Serve at once or cover and refrigerate until ready to serve. Nutritional Information per serving: Calories 40; fat 0.1 g; saturated fat 0.01 g; % calories from fat 2%; protein 0.8 g; carbohydrates 9.7 g; cholesterol 0 mg; sodium 2.5 mg; fiber 2.76 g.
Why: Fresh apricots are tasty, low in calories and can be used to sweeten a variety of dishes. Nutritional Information (1 cup sliced, about 4 apricots): 79 calories; 1 g fat; 19 g carbs; 3 g fiber; 2 g protein. Health Perks: Apricots are loaded with vitamin A — 1 cup has about 3,178 IU, or 64 percent of your daily recommended value. The vitamin A in apricots converts to the antioxidant beta carotene, which is involved in the growth and repair of skin tissue and may protect against sun damage. Additionally, it is said to have anti-cancer effects and to enhance immune system function. Apricots are also packed with vitamin C (27 percent of the daily recommended value), plus potassium, iron, copper, and the antioxidant lycopene. Purchase Tips: Look for apricots that are firm and plump with an orange-yellow to orange color. You know they’re ripe when they’re soft to the touch. Putting ripe apricots in the fridge will prevent them from going bad. Avoid apricots that are yellow or green, or if they’re bruised or dried up.